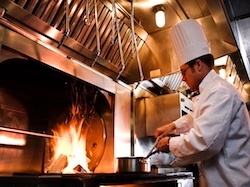 Not all kitchen fire suppression inspections are created equal—which is something few restaurant managers notice until they absolutely need to. And by then it’s too late. You may have an updated inspection tag on your system, but what does that really say about how safe you, your people, and your facility are? Unfortunately, it doesn’t tell the whole story and can in fact be meaningless. “Many restaurant owners don’t know what goes into an inspection and don’t care, but I think they would care if they knew they were getting half the price but none of the service,” said Jeff Wyatt, executive vice president of Koorsen Fire & Security. “It’s easy for a company to come in and take the tension off a system, take the nozzles off and put them back on, and then leave in 15 minutes. You get a new inspection tag and nothing else. How long have you been in the life safety industry? How much experience do you have servicing kitchen fire suppression systems? A handful of companies are just now getting into kitchen fire suppression inspection and service. Unfortunately, they’re luring customers with low pricing, but they have very little to no experience or knowledge of how these systems work. Are you a distributor for the specific brand of system that is in my kitchen? Are you certified to be servicing and inspecting the specific brand of system in my kitchen? Koorsen is a distributor for every brand available, which means that we have been certified to install, inspect, and service whatever brand you have. We receive all of the updates to service manuals and every bulletin issued by each brand. In short—our techs are armed with all the most recent inspection standards and information they need to effectively do their jobs. Does your inspection include a trip test and a fuel shut down? This is required by the National Fire Protection Association and is often overlooked. Do you perform a complete pipe blowout during your inspections? Grease builds up and can block the pipes in your system over time, and there’s no way to know from the outside that your pipes are clear. The blockage can occur way up in the ceiling, and it can easily affect the functionality of your system. In most states, technicians are required to blow out the pipes during an inspection. Are your technicians insured and bonded? Are all your technicians background checked? Most kitchen fire suppression inspections take place when your business is closed. Make sure you are working with a company you trust. All Koorsen employees are background checked, and we do not use any sub-contractors. If there’s not a Koorsen location in your area, please do the best thing you can for your business and your employees and customers. Find out exactly what you’re getting from your inspection. You might never need to know that your inspection was thorough, but then again, you might. And the wrong inspection service can make all the difference in an emergency. Do I Need a Fire Extinguisher in the Kitchen Area?